Switch stove onto 5, get a small pan out and pour milk into it. Add oats into milk and stir, until it thickens. Once thick enough serve in a bowl and mix in cinnamon. Add blueberries on top and enjoy. I soak the oats and cinammon in water overnight, with either blueberries or raisins on top. Much prefer it like that. I always soak oats overnight in water - think oat milk! Creamier, higher in Resistant Starch (RS). RS is linked to increased satiety, improved weight, & better digestion - and you don't have the fat or calories of the milk. 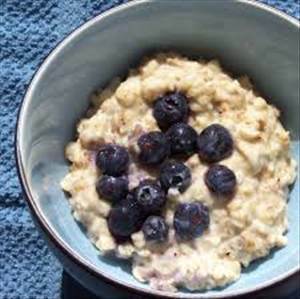 There are 253 calories in 1 serving of Blueberry & Cinnamon Oatmeal. Calorie Breakdown: 15% fat, 70% carbs, 14% prot.